It’s 2044, and as a result of the energy crisis, the world has basically gone to pot. That’s okay, though, because most people spend their lives in OASIS, a virtual utopia where you can be whomever and whatever you want. Five years ago, the creator of OASIS died, and as his dying act, set up a contest: be the first one to find the Halliday “Easter Egg” and you will inherit Halliday’s fortune of billions of dollars. Wade is one of those obsessed with the contest, and with Halliday, which means he’s into all of Halliday’s interests: everything 80s. As Wade delves deeper into the contest, he finds friends and allies and makes enemies who will go so far as to kill him in real life in order to get to the prize. This was a last-minute impromptu buddy read with Kelly from A Written World. We traded questions for our review; click through to her blog to see her answers to my questions. 1. This book has had a lot of hype surrounding it around the blogosphere. Did it live up to the expectations you were expecting as a result? Actually, I missed the hype surrounding this one (one of the side benefits of working, I guess) — I did pick it up as a result of a review on a friend’s blog, though — and so I went in with a fairly clean slate. I suppose, if I had read a lot of hype, if it had been one of those books I’d been seeing everywhere, I would have had a worse attitude. I think going in with no expectations was the best way to go here. 2. What did you think of Wade, the main character? Was he he someone you could enjoy enough to read the book from his perspective, or did he bother you? 3. What were some of your favourite (geeky) references? Ah, I ate up the 80s stuff. Seriously. War Games! (Loved the movie.) Ladyhawk! (Ditto) All the little ones (Back to the Future, Hitchhiker’s Guide, Knight Rider, John Hughes movies, Pac Man) that were sprinkled throughout just gave me little bursts of glee. The only things I didn’t get were the gaming references — I wasn’t, and am not now, a gamer — but Cline explained things enough that it didn’t bother me that I didn’t get the in-jokes. 4. What did you think of the secondary characters? Did any stick out for you? 5. What did you think of the whole idea of the book? Did the game and the Dystopian aspect work for you? I’m not sure the dystopian aspect worked. As I was talking to my husband about the book, and he kept asking questions about the world: how do they survive? Where do they get food? Money? Everyone in the world can’t all always live inside the virtual one? But, I’m not sure I really cared. Because I got sucked inside the virtual world as well, wrapped up in the game. The parts when Wade wasn’t playing — like after Art3mis dumped him — were the sluggish ones for me. 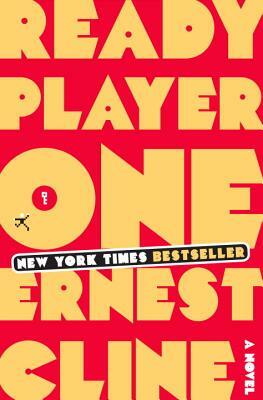 But, when Wade was fully immersed in OASIS and the game, the book was hard to put down. I'm planning to read this, but I think it is my husband who will really love this one. Yeah, it really is a guy's book. Especially one in his late 30s, early-40s. That said, I had a lot of fun with it. I think I am directly in the demographics for this one (now 41 year old male child of the Atari and arcade-console era). My favorite read of 2011. maybe not the best book, but may favorite read. Wil Wheaton's performance of the AudioBook was also worthwhile. My post is up now! I would have had it up sooner, but the guy had a 'guys night' last night and I took advantage of the empty house to read… Sorry I am a bit slow!